Provides superior filtration. The large design provides the perfect brew each time because it has an extra fine mesh basket. There's no need to add any filter bags to this infuser to steep tea! Just add your favorite loose leaf blend, hot water, and steep for 2-3 minutes until you have the desired strength of tea. Remove the infuser from your cup, place on top of the provided drip tray lid, and enjoy! Built to Last with high-quality lead-free, rust resistant 304 stainless steel, so all you taste is your tea. We had our tea strainer custom designed and made responsibly to provide you with the best tea drinking experience possible. Infuses More Than Tea! Great for infusing herbs, whole spices like cinnamon sticks and cloves, and even fruit. Comes in a custom gift box. Give the Gift of Tea. Get one for yourself for home, at work, and for a friend! Customer Approved. Check out our customer images, and read the verified positive reviews. 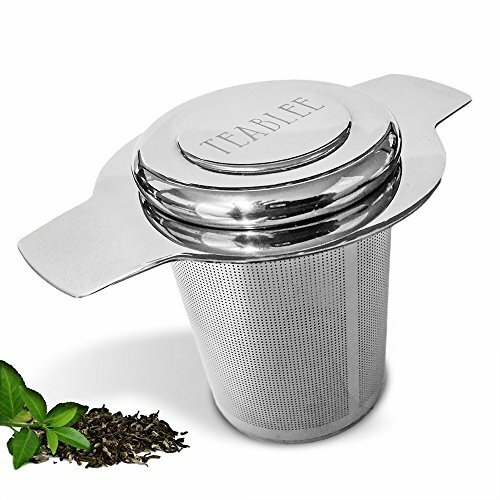 Your Tea or Coffee Mug is begging for a genuine Teablee brand Tea Infuser Strainer. Click Add to Cart Now and become our next happy customer! If you have any questions about this product by Teablee, contact us by completing and submitting the form below. If you are looking for a specif part number, please include it with your message.